The library will be closed on Monday, November 12 in honor of Veteran’s Day. We wish everyone a safe holiday and to please remember our veterans. 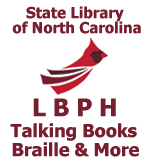 September 13th marks today as North Carolina Library for the Blind and Physically Handicapped Day! Due to inclement weather and safety concerns for our guests and patrons, NCLBPH has decided to postpone the 60th anniversary party until an undetermined date.